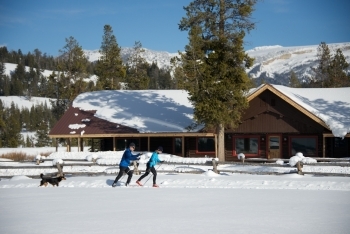 Winter at Turpin Meadows Ranch is one of the most beautiful times of the year. Of course, summer is pretty spectacular, too! 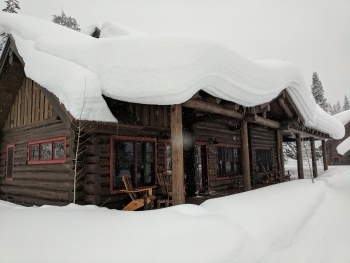 But with the ranch covered in a blanket of white fluffy snow, the animals venture a little closer, a fire is often found burning in the lodge fireplace, and we start bringing out the winter sports gear and grooming the 20km of trails for white season activities, like Nordic skiing, fat biking, snowmobiling, and snowshoeing. We can’t help feeling a little excited for the “White Season” here at the ranch. 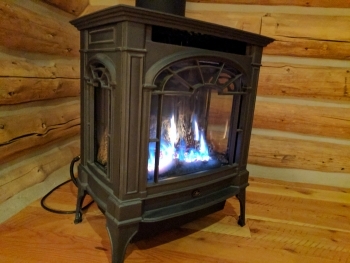 When visiting Turpin Meadow Ranch during winter, there are some items that would be considered a “must have” for ensuring the complete enjoyment of your stay. Some items may vary, depending on the activities in which you prefer to engage, but these basic items will remain essential. Waterproof hiking boots: although the majority of the walkways are groomed, you will be traversing on or through snow frequently, so it is a good idea to bring warm, waterproof boots that are comfortable for hiking long distances. Your feet should be comfortable inside them while wearing 1-2 pair of warm socks. Waterproof winter jacket or parka: even if the snow is not falling, it’s a good idea to have a waterproof outer layer that will hold in heat while allowing your core to breathe. This item will be useful during your outdoor activities, as well as moving between buildings at the ranch, and should be loose enough to fit over inner layers. Warm mid-layers: fleece, woolen, or flannel mid-layers will help keep you warm both inside and out, and can be increased or removed as needed to make you more comfortable. Extra pairs of fleece or woolen socks should be included in this category. Waterproof pants: with snow in drifts all around, it’s a good idea to bring waterproof snow or ski pants to help keep snow or ice from caking on pant legs, which can cause cold, moisture, and discomfort at your skin, and ultimately frostbite. Gloves: a set of waterproof gloves is essential for just about any outdoor activity; generally, you will also want an extra set or two of fleece or woolen inner gloves to help keep your fingers warm, especially when moving at speed on fat bikes, skis, or snowmobiles. Gaters: these are waterproof coverings that cover the tops of boots and extend up the leg, similar to spats. They are recommended particularly when waterproof pants are not used, but ensure snow does not enter the tops of boots in either case. They are popular for snowshoeing or for any adventures off a groomed trail where unpacked or powdery snow will be encountered. Sunglasses or goggles: winter in the high desert mountains often includes a lot of sunshine, which is exacerbated with glare off the snow. A pair of sunglasses with UV protection will be essential to prevent sun blindness and eye damage. If you will be participating in sports at speed or when snow is falling, a pair of snow goggles is also recommended. Head protection: a warm knit hat is recommended, even if your jacket has a hood. Ear coverings such as muffs or a hat with ear flaps will keep your ears warm and comfortable. If snowfall is expected or you will be participating in sports where you will be impacted by wind, a face mask will help protect your lower face from cold and frostbite. Flashlight/headlamp: the sun sets much earlier in winter, and it’s not uncommon for White Season outdoor activities at the ranch to spill over into sunset or beyond. 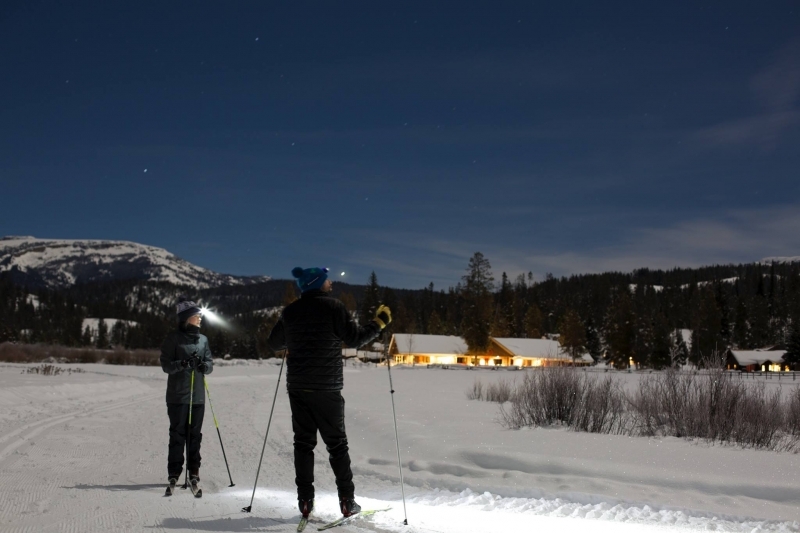 A lightweight, LED-powered strong flashlight will help navigate in darkness; a headlamp is also recommended for keeping hands free for skiing, snowshoeing or fat biking. GPS unit & other safety gear: in the remote areas near the ranch, mobile signals don’t always extend to every spot. Especially if you will be exploring the backcountry, bringing a fully-charged independent GPS unit and noting the GPS coordinates of critical locations will allow you to navigate back to the ranch, even if darkness descends. Other safety gear recommended during backcountry use are avalanche beacons, a foldable shovel, a snow snorkel, a paper map, and avalanche probes. Two-way radios may be needed to communicate with your party if you become separated. Cozy slippers: although your cabin or chalet includes a gas stove for heat, you might find your stay more comfortable with a pair of warm, fuzzy slippers or booties to use while lounging in your downtime. Water bottle: to help ensure you stay hydrated during activities, bring a reusable water bottle for each person in your party. You can refill them at your cabin or at the lodge before you head out for the day. Camera and chargers: there will be many photo ops during your stay! Make sure to bring your camera, whether it is in your phone, or if you pack an SLR. Chargers and extra batteries are a good thing to include to make sure you don’t miss that perfect shot! If you are planning on participating in a specific sport while at Turpin Meadow Ranch, you are welcome to bring your own gear. We do rent gear by the half or full day for most winter sports available at the ranch, or we are happy to recommend a local rental company. 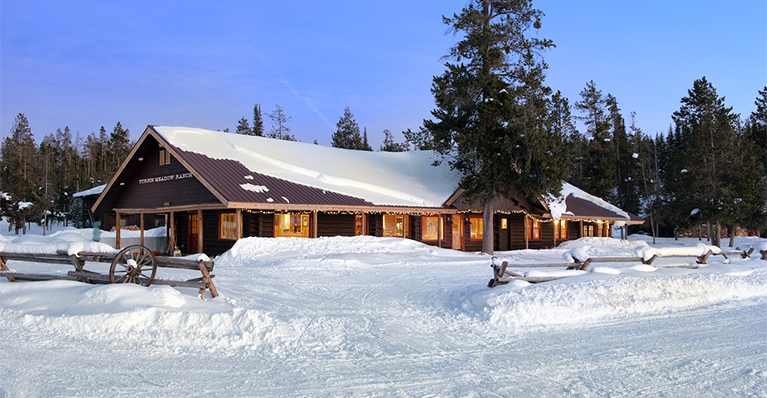 When you’re coming to Turpin Meadow Ranch for White Season adventures, our trails are included for overnight guests. Day passes can also be purchased. Did we miss any gear you find valuable while at the ranch? If so, please let us know! We’re looking forward to seeing you here for your idyllic winter adventure!